It's almost Mother's Day. Yippee Skippee!!! I love Mother's Day!!! For starters I get to sleep in. Fabulous!! Then my beautiful children toddle in singing me a Mother's Day song with Breakfast in bed and lots of beautiful homemade presents and cards. Love em!!! And then if I have managed to get hint just right I might get a special little package. Maybe some of this . . .
Love it!!! So, have you hinted to your spouse??? We'll here is a little hint to pass on to them for sure!! Julie is holding a special Pre-Market sale at The Intrepid Thread. with the coupon code MARKET20. It starts Thursday so you can spend today picking out your favorites and then have your loved one jump on it Thursday morning. Yippee Skippee for an awesome sale and you lucky readers have the jump on it. Pop on over and visit The Intrepid Thread and then come back here and leave a comment of what item in her shop you would love to receive for Mother's Day. For a bonus entry you can sign up for The Intrepid Thread newsletter and leave me a comment that you did so or already receive it. That's it. Up to 2 entries per person. Giveaway is open to international entries. It will close on Sunday, May 13th at 5pm and a winner will be selected randomly and announced shortly after. I am already on IT's mailing list. I would love Cocoon FQ Bundle in Sapphire for M'Day (and B-Day). I am already at The Intrepid Thread mailing list. I could totally go for some Cocoon fabric. I would love some A Walk in the Woods for mom's day! I'd love to have a half yard bundle of Flock! I'm on the Intrepid Thread mailing list. Lots of lovely things but I think it would have to be Utterly Inspired by Maureen Part Two Fat Quarter Bundle - really lovely. A great website too. Thank you. All of it - Iprobably Flock. I get their news letter. Flock or outfoxed or summersville...I cant decide! I'd love to win some Summersville, I adore it! I already subscribe to The Intrepid Thread's newsletter! 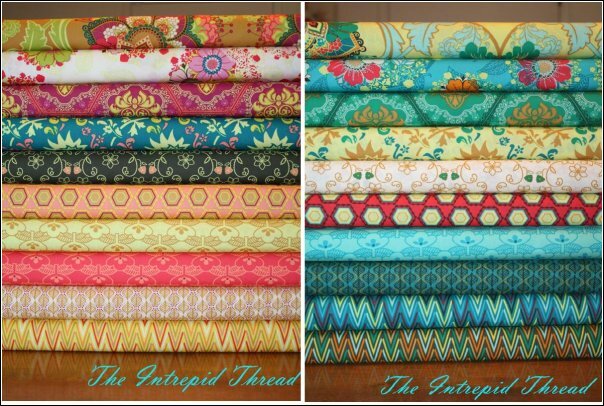 Is it wrong that I want quilt blocks fabric from intrepid thread? I've been lusting over those circles! Just signed up for their newsletter ..... now off to explore their site ... now where is that Credit card! Oh, I'm aalready on Intrepid Thread's mailing list and I'm a fan! And if you're Really asking, a fabulous Mother's Day gift for me, and one I would love to give to My mother too, is: Rhapsodia - Fat Quarter Bundle Complete Collection Plus. What a fantastic group of fabrics, even better with the coordinates that Julie so deftly and lovingly prepared. Genius! I would love the Summersville fat quarter or half yard bundles!!! I would love the Rhapsodia complete collection bundle for mothers day! I subscribed to her newsletter. I would love summersville, cocoon, flock. She has so many lovelies. I want the Summersville charm pack! Nice! I'd be chuffed to bits if someone got me the Riley Blake Chevrons, even tho' I'm only a 'mom' to a dog! No kids, just a four-legged furry friend. I am now on Intrepid Thread's mailing list :) Thanks for the chance to win some yumminess! Great fabric. I'd love to receive Apple Of My Eye - Fat Quarter Bundle Entire Collection. Fantastic. I would love to receive that same bundle you show on top, the Summersville - Fat Quarter Bundle. So fresh for summer! And I am a subscriber tho the Intrepid Thread newsletter! I love to get the Cocoon - Half Yard Bundle In Rubywine from The Intrepid Thread for Mother's Day! I already receive the Intrepid Thread newsletter. Thanks for the second chance to win. I always drool over the bundles at intrepid, I really can't choose, I love blues and reds, but some of the combinations she comes up with are just awesome! Tangerine Tango Too Fat Quarter Bundle - that would be my pick for Mother's Day - so delicious - thanks for the chance to win! Definitely some Summersville! I love it! Lol! I must be greedy, but for Mother's Day I would love the Half Yard Bundle of Cocoon ... the full range, lol!! I already receive IT's newsletter! Thanks for the giveaway! I would love the Summersville fat quarter bundle!!! This year is my first as a mother! I already receive the Intrepid Threads newsletter! I'd love some of the Fruit Slices series for my mother! Even though it isn't in yet, I would like some Vintage Modern in a fat quarter bundle! Apple of My Eye please!! thanks for the giveaway! I receive Julie's awesome newsletter! Hanauma Bay Teal 1/2-yard bundle. Thanks for the giveaway. I am in love with Cocoon over at The Intrepid Thread & Julie has lots of it! Wish I'd get some for Mother's Day but know I won't, so I'll be using that 20% off this weekend! Love the colors in the Quilt Blocks fabric - thanks for the chance to win. I would LOVE Apple of My Eye! Gorgeous fabric. Thanks for the giveaway. Flea Market Fancy...sigh... I never got it before and I just love it! Already receive the newsletter! thanks for the chance! I like Apple of My Eye fabric. Thanks for the giveaway! I would love to win Quilt Blocks. I have the perfect quilt in mind. I would want anything from Julie's shop. Everything is so beautiful. I love the fabrics and i do try to hint to my spouse, but he just doesnt understand. Its quite sad. It has to be the summersville for me! I'd love some Vintage Modern. I just love all of the projects that I've been seeing with it! That or Flea Market Fancy...or everything...! Thanks for the chance! I am loving those quilt blocks prints :)!!! Swoon! I get Julie's newsletter- love it and her!! I have purchased from Julie twice now and her service is wonderful! I just bought "Apple of My Eye" and it's gorgeous! I've had my eye on "Flock" for sometime, but "Summersville" and "Cocoon" have stolen some of the lime light now. And the more I see Rhapsodia, the more I really like it. Choices, choices!! I already receive her news letter. I love the QUilt Blocks fabric, but I would also like to receive some Summersville - adorable!! I am subscribed to the Intrepid Thread's newsletter. Thanks for the chance to win! I love her shop! I just want gift cards so I can go crazy! I'd love to get some chevrons or some fruit slice. 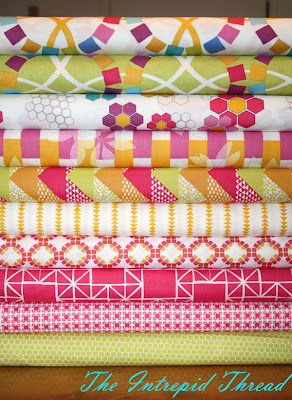 Oh I would love to receive a fat quarter bundle of summersville - I just love it!!!! I am signed up for her newsletter. I LOVE Pat Bravo's Poetica fabrics especially the Hearts in cool. And I signed up for the newsletter. Great to find a new shop! Hmm... That bundle of Quilt Blocks fabric would be a perfect Mother's Day gift. On the other hand, as a mother I am always looking for something to make for my little boys - I love the Peak Hour fabric from the shop! I'd love the Maya Bundle or some Summersville! I'm on the Intrepid Thread mailing list. :) Thanks for the giveaway! It's not Mother's Day here, but I's settle for some Lucy's Crab Shack any day! http://www.intrepidthread.com/shop/Fabrics-by-Collection/Cocoon/p/Cocoon--Half-Yard-Bundle-In-Stone.htm ... would love to receive this for Mother's Day! I am loving coquette's watercolor stripe in buttercup - so perfect for spring! A walk in the woods is very sweet. I signed up for your newsletter! Thanks for the nice giveaway! I would love to get the Tangerine Tango Too Half Yard Bundle for Mothers Day! it's gorgeous! Thanks for another wonderful giveaway!! I would love anything in Cacoon....especially Stone. So many cute fabrics! Would love a bundle of Apple of my Eye! I love the Starflakes and Glitter - Polar Bear Express in Red! signed up for the newsletter! thank you! I just love Vintage Modern. Wouldn't that make the cutest quilt?? Thanks for the giveaway. I could make an adorable dress for my daughter with flying free dandelion print. The "Quilt Blocks - Fat Quarter Bundle Complete Collection" is what I'd love, love, love for a Mother's Day gift! I love Apple of my Eye. Have been wanting some for awhile. I'd love some Summersville for Mom's Day. I'm already on the mailing list for Intrepid Thread. Thanks for the fantastic Quilt Blocks giveaway! I already receive the newsletter. Thanks for the giveaway. I get the newsletter already. I would love some Vintage Modern! Thanks for the giveaway. I would love to have some Pagoda Lullaby..Tutty in ivory. I already receive The Intrepid Thread newsletter. Can't wait to receive my first newsletter. Would love some Cocoon Rubywine. I signed up for Intrepid Thread's Newsletter! I signed up for The Intrepid Thread newsletter. I have been following them on Facebook for some time now and love their materials! For M'day I'd love to have the Quilt Blocks - Fat Quarter Bundle in Spectrum - gorgeous fabrics and I have an idea for a quilt for me!! Thanks for a great giveaway ... Love your blog!! Summersville has been on my mind big time, a nice bundle would be heaven. I'd have to say the Riley Blake Chevrons! OMG what pretty Fabric and wow what wonderful projects i could do if I was to win this Fabric. I would love to get Rhapsodia in Dream Voyage! It looks so playful! Love the Quilt blocks line, would be a fine present! Thanks for the giveaway! Still don't have any Walk in the Woods! Would love that. I would love some vintage modern yardage, thanks for the giveaway. I would love to receive a bundle of Apple Of My Eye! I am already signed up to receive Intrepid Thread's newsletter. Poetica I would love to see in my sewing room..... Thank you! I'd be thrilled to get ANYTHING but I love charm squares and jelly rolls. I would sure like to have some Flea Market Fancy!!! I would love some of the Summerville (or of the million other gorgeous fabics...)! I still haven't got any FMF!!! I'm on Julie's newsletter list! I wouldn't say no to more Chevrons. Or quilt blocks either, for that matter... Thanks for the giveaway! Well, I'm not a mom (but I am an Aunt that helps out with her nephews at least once a week). I am totally loving Flying Free and Lucy's Crab Shack and can see using that to make something special for my mom and sister. I would adore the Cocoon Fat Quarter bundle, the whole collection.. because if you're gonna dream, dream big, LOL! I would like to be on your mailing list - I'm a friend of The Intrepid Thread on facebook. Thanks for the giveaway -- I would love anything from the Spectrum or Marine collections. My name is Sheila and I am a fabricoholic! I would love to receive a Rhapsodia bundle in the Sweet Journey colorway. My favorite fabric at the moment on their site is pearl bracelet in light orange. Thanks for the giveaway. I have previously signed up for Intrepid Thread's newsletter. When you are drawn to something you just have to let that feeling have its way. And I was drawn to "Hello, Pilgrim". I just kept coming back to it. And I follow my instincts. I subscribe to IT's newsletter. I'd love Summerville and of course this bundle that you are giving away. It is perfect! 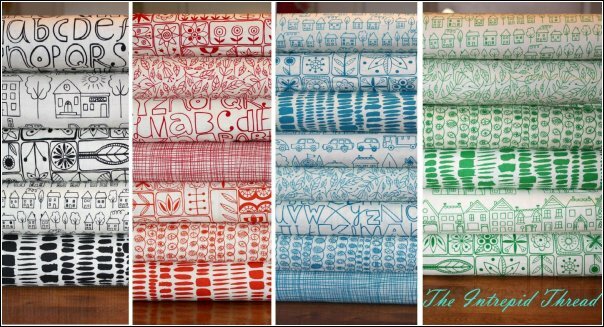 I would love some of the Summerville fabric, especially the black and white stack. I would love yo receive the Salutations quilt kit! It is fry beautiful! Hmm.. since I am not a mother and not even of the correct gender to be one, I doubt that I will get anything for Mother's day. But I wouldn't mind it if I got a bundle of Cocoon in Rubywine. I already receive Intrepid Threads. Newsletter and I love it! Summersville is one of my all time favorites! And I signed up for the newsletter! I'm loving Art Gallery fabrics right now, so I'd really love to have a FQ set of Rhapsodia to make some clutches! Oh my, I crave the Desert Daydreams Desert Blooms, especially in turquoise! Since I already bought Cocoon for myself for mother's day, then I would have to say the Summersville Fat Quarter Bundle of the entire line. I just LOVE it! I'd love some Rhapsodia. Or Pezzy prints. Or Rily Blake Chevrons. Who am I kidding? I'm a fabric addict. I love them all! I already follow Intrepid Thread and get the newsletter. I'm really liking the aquas and greens in the Picadilly Market and the Rhapsodia lines. They'd be fun to play with together. I want the Hanauma Bay half-yard bundle...will someone please e-mail my husband?? I'm on the IT mailing list. On the Intrepid Thread subscription. 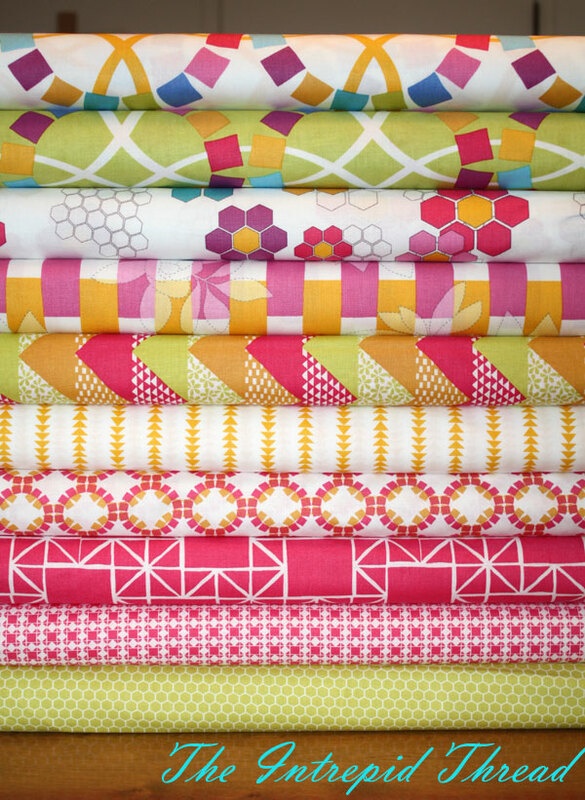 I'm loving the Quilt blocks Hex dots fabrics (in every color)!!! I'd love to have some of those Chevrons....I am drooling over them! Thanks for the giveaway-- you'll make someone very very happy! I receive the newsletter from Intrepid thread. I'm a subscriber! Thanks for the chance to win ths great bundle!! !